Buddy Club Racing Spec Camshafts - Pann Auto Performance - San Diego largest aftermarket automotive performance parts - What do you drive? We’ve been developing and producing our original camshaft ever since Buddy Club had established. Still today, we are providing high performance camshaft to our racing teams and winning lots of titles. We worked on to get an ideal well-balanced profile of camshaft and succeeded to give it 1.3 to 1.5 times more effective area than regular camshaft. 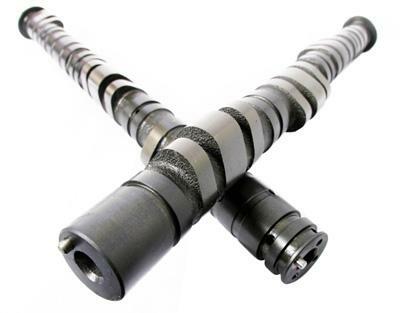 Every Buddy Club Camshaft is carefully built through these production processes. Plus, strict inspection will be given to them and only the highest quality products are shipped. Coating the surface of camshaft with manganese phosphate in order to protect from damage even when the camshaft has not lubricated yet. This has done by steeping press process that produces 0.5mm to 15 micromillimeter thin of manganese phosphate coating on its surface to prevent from direct contact with other metal parts while realizing smooth operation. Wavy grooves are curved to the cam profile surface by oscillation during cam grinding process. Oil pool that is formed on the cam profile surface reduces a friction loss and prevents locking. We used the super high precision high speed grinding. Peripheral speed 80 m/s 4400rpm. The combination of a ultra high-speed main bearing and diamond grindstone is controlled by the newest 32-bit computer. By using the same special-purpose machine as an automaker, high precision grinding is realized though in 1/3 period of time.